Canada's west coast province is celebrated in this collection of songs sung with strong voices and harmonies, accompanied by guitars, mandolins, dobro, and percussion. All are in a beautiful package and masterfully engineered. 9. Are You From Bevan? 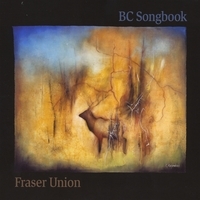 BC Songbook is the latest of Fraser Union's four cds. This collection is exclusively of and from British Columbia, Canada's westernmost province. These songs tell of the history of B.C. 's working people, from "The Grand Hotel" and its lodgers in from the camps to "The Bridge Came Tumbling Down," which recalls the disastrous 1958 collapse during construction of the bridge crossing Second Narrows. All these songs, delivered by four strong voices accompanied by guitars, dobro, and mandolins, celebrate a particular part of the world. This is truly "roots music," with roots on the west coast, where we have planted our roots, as well.